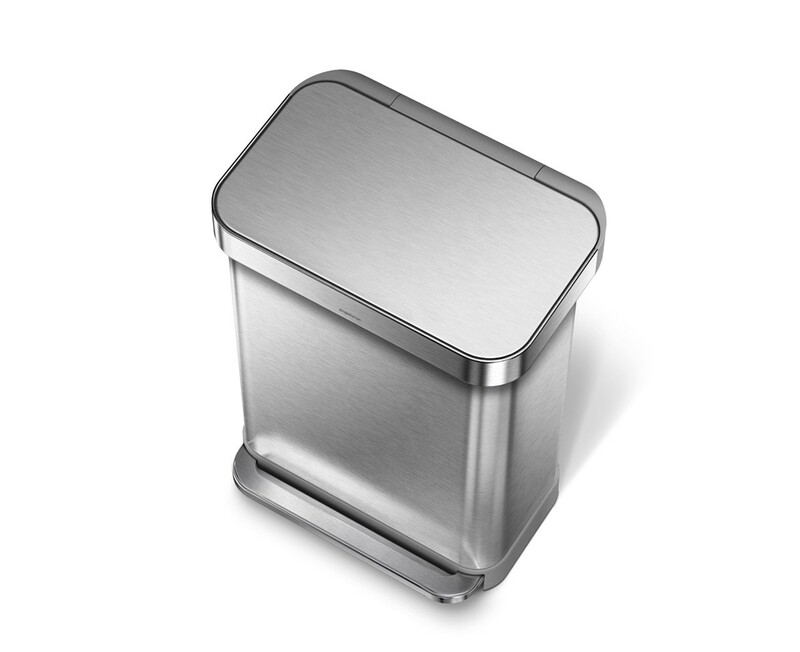 Our new stainless steel rectangular pedal bin features an innovative 'liner pocket' that stores and dispenses liners from inside the bin for a faster liner change. The stainless steel liner rim grips the liner and keeps it hidden. And with no inner bucket, there's more space for waste. Strong wide steel pedal is designed to last, and our patented lid shox technology ensures a smooth, silent close every time. Code Q liner refill packs store perfectly in this bin's liner pocket. Keep liners where you need them. Dispense them one-by-one from inside the bin for a faster liner change. By eliminating the inner bucket, we managed to get the same amount of capacity into a smaller, more space-efficient bin. One side for rubbish, one side for easy disposal of recyclables. Code Q liners are designed to fit this bin perfectly and are extra strong to prevent leaks and tears. Refill packs dispense liners one at a time and store perfectly in bins with our new liner pocket feature. I love this bin for two reasons: Number one is that it is so easy to replace the bag that I actually enjoy taking the bin out now. Number two is its looks , stylish and sterdy. Also, it is spacious enough that it is comfortable to empty trash into it. I got this can to keep 2 puppies out of the trash, and it has worked extremely well. It makes for one less mess to clean up. Thank you! Belle poubelle au niveau du design, très grande, silencieuse. Cependant au vue du prix je suis déçue, elle est arrivée déboitée de l'arrière. Du coup impossible d'installer les sacs poubelles au dos car la réserve ne se met pas correctement. Il y'avait aussi une rayure sur le couvercle. En conclusion c'est dommage! Bonne grandeur, utile et "belle"! Life is easier with this trash can! Bought this trash can, not only because it is attractive for a trash can, but because of the liner pocket feature. How resourceful! The bags fit perfectly, don't show, are of very good quality. I say life is easier now, because my husband would NEVER replace the bag in the trash can, NOW, since it is RIGHT THERE, he does. And likes it.. The soft close feature is nice too. My dogs aren't happy, that they can't knock it over and have a field day with it, but that's ok with me. I liked it so much, I bought a 30L one too! Hi, i use this bin for my work and i love it !! I open it 200 time a day !! Cette poubelle est génial !! la taille d'ouverture est pratique, l'accès au sac poubelle est une idée tellement simple et pratique ! This is my second simply human garbage can. My other one was smaller and had some black on it. I really liked the first one and it still worked after years of daily use. But I like all silver better and the bigger can is very nice. The one thing that is different and its good and bad is there is no liner to the new one. I like that because I had to pull the plastic liner out to get the bag out of the first one and now I don't. But I feel like this one might dent easier since it doesn't have the liner. But there is less to clean which is nice! I also love the little bag holder section in the back of this can. Very nice! This bin is awesome. For having bought Brabantia, this one is of a much better quality, fingertip proof but really and perfect because it's a flat back. Cette poubelle est géniale. Pour voir eu Brabantia, elle est de bien meilleure qualité, elle ne marque réellement pas et est parfaite parce qu'elle a un dos plat, gain de place. Je suis RAVIE de cet achat. I'm extremly HAPPY with this. We love the step can. The waste bin is beautiful. Sleek and compact but roomy enough to hold a good amount of stuff. I know have three of them in my office in different areas and they look great in every room. This is quite simply the best bin I have ever owned. It has a large opening so that you never get the surrounding trim dirty. The lid closes quietly and softly. I wasn't sure I would use the bag holder which is built in so that the bag can be accessed from inside the bin, when changing the bag, but it makes life so much easier, and quicker when changing bags. 10/10. Just replaced aged touch sensor version with this bin. Very smart - much easier to change the bag in this model but still stand over it like a loon waving my hand over where the sensor was on the old machine before realising I have to push the pedal. D'oh! I never thought I would love a bin, but I do. 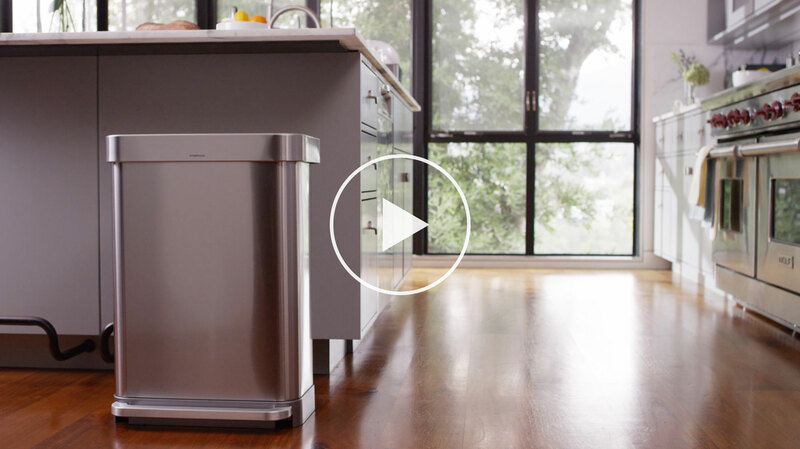 It's efficient, requires little cleaning, liners fit securely and are easy to change. It's easy to position in my kitchen so it doesn't take much space- perfect!! I worried that it was 'only' 55L (had an 80L bin before that), but I can fit lots in the bag without worrying about it splitting. And the weight of a full bag is more manageable, too. 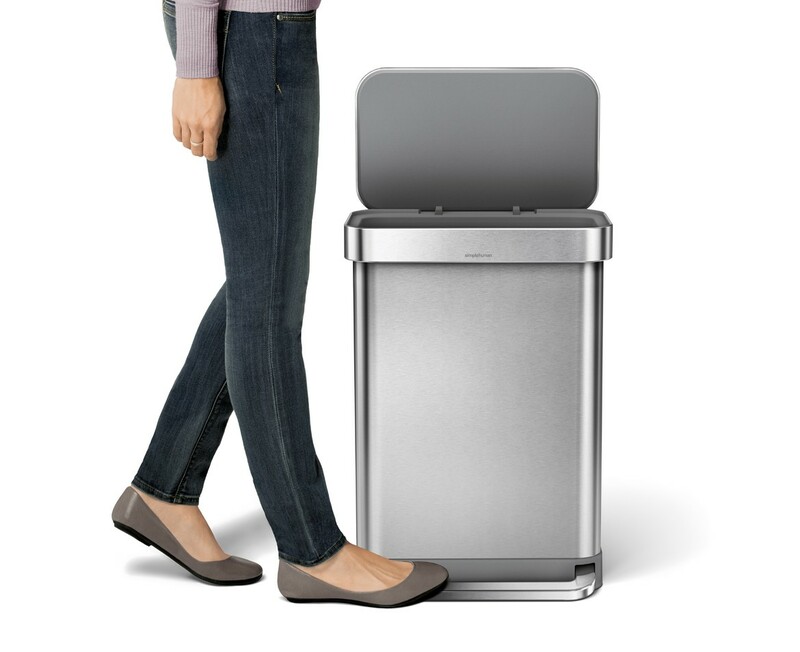 Thank you, simplehuman! Nice can with great capacity, little pricey but nice. Only complaint is that it scratches kinda easily. Une perle dans la cuisine! 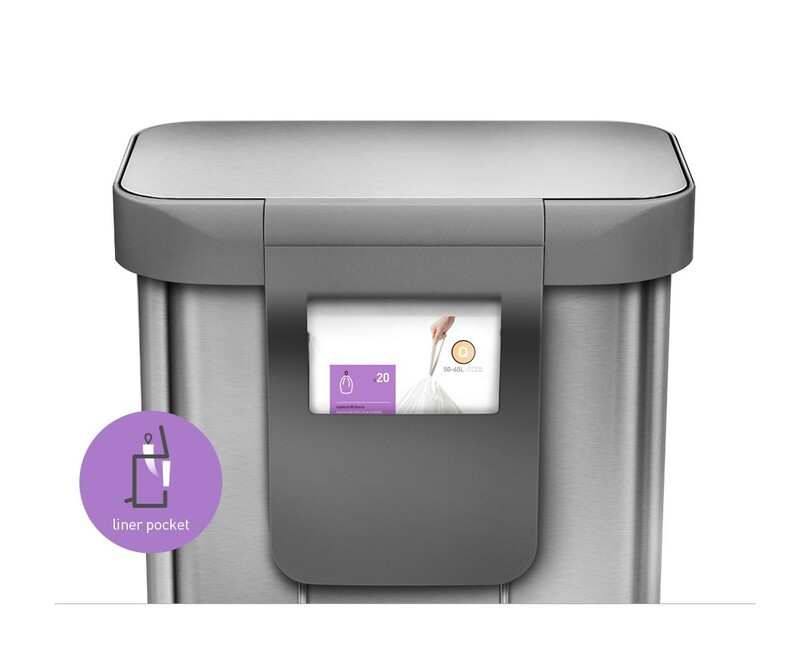 We were looking for good quality bins that would match in with our stainless steel kitchen and were disappointed at the quality in various stor Looking online, the Simple Human bins site looked good, with video content showing the actual bins and various features, although short, these convinced us to buy them. The bins were duly ordered, but we did have an issue with delivery because we ordered on the weekend of the Black Friday sales. When I called in, I asked if we could get a date for that week, as no one would be home the following week and was told no. The chap was happier to cancel the order than to actually help. I then called back in and spoke to another lady who did sort it out. I ordered two of these bins and when they duly arrived two days later, they were unpacked. One bin had a slight crease on the lid. I didn't bother to call, but was disappointed by this. At over a £100 a bin, I really don't expect this. The bins themselves are lovely, well made with attention to detail, such as the pocket to keep the liners in and allows you to change them easily. Even the inside of the lid is lined with plastic, which keeps it easier to wipe down, if it gets dirty. The soft close lid is also excellent. Putting the bags on and keeping them out of sight is also good, with no liner showing. It's more the little things that the company has thought of that just makes the experience better. Overall, the best bins we've ever owned and happy with them - minus the crease and the questionable customer service. A customer service agent will contact you with regards to the creased lid. Awesome trash can - get compliments all the time. The only ding was that it literally came with a tiny ding on the top lid. That was it! Thank you for your review. We're so sorry to hear that the lid was damaged. A customer support representative has reached out to you to provide further assistance.